It began with a challenge: to dine out in Tulsa every day, lunch and dinner, on a total budget of only $99. Could this be done and still enjoy flavorful, exciting, local dining? This coupon-clutching girl took the challenge on and set out to discover just how far her dining dollar might go. Here in Part 1 I walk through my experience with dinner each evening. I realized that around $35 of the $99 needed to allocated for lunch, and that left only $64 for dinner, around $9/dinner. 1. I would not include tax, gratuity or alcohol in the $9 average daily dinner goal. 2. I would be seated at or after 5 PM, but before 9 pm each day. 3. I would include Asian, Mexican, Southern cuisine along with a hamburger, BBQ and a seafood dish in my selections. 4. I would enjoy an entrée at each restaurant. Remembering many restaurant specials are limited to dine-in only and often in limited supply, I went in search of Tulsa’s best value in dining. I began the dinner part of Project 99 on Monday evening by enjoying a fresh ground, Black Angus Burger at SMOKE on Cherry Street’s $5 Burger Night. Thank goodness I arrived early! This popular Cherry Street Restaurant often sells out of its Monday night special. No wonder! Served with sides of garlic aioli, whole grain mustard and their signature ketchup (all made in house), this entrée serves up pure flavor. Accompanied also by house made fries. 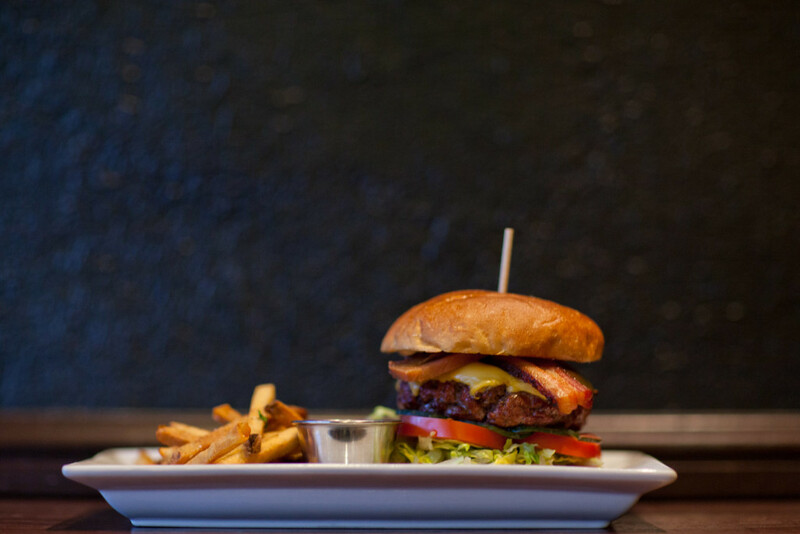 With lettuce, tomato, American cheese and onion on the side, you can dress your burger exactly how you want. 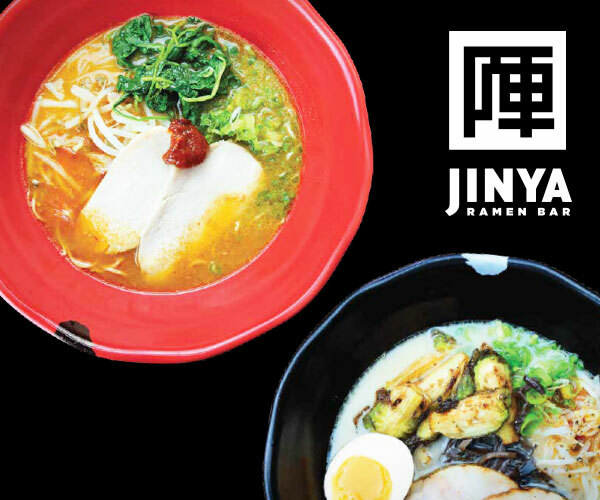 Dine in only beginning at 4 PM while supplies last. I checked “burger” off my list and had $94 left in my pocket. SMOKE, 1542 E 15th. 918.949.4440. www.smoketulsa.com. Tuesday found me nestled into El Guapo’s Southside smartly outfitted location enjoying $1 taco night. 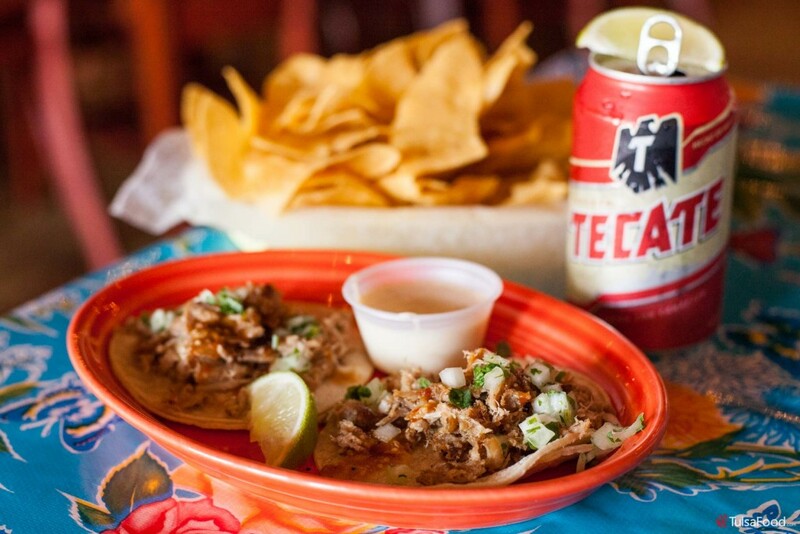 From 11 a.m. – 10 pm, enjoy three Tacos El Guapo! This dish includes three tacos with corn tortillas, onion, cilantro, spicy tomato salsa and your choice of meats including Carne Asada (grilled beef steak), Carnitas (pulled pork) or my favorite, Tinga (shredded smoked chicken in a mild red Chile sauce.) Add Poblano rice and choice of beans for $2.99 and really enjoy a taste of the border! However I stuck with my 3 tacos, trying to save as much as I could at the beginning of the journey. Of course, I had to order a $2 Tecate since I didn’t have to count alcohol in my cost…That’s what I did and my food bill before tax was 3 bucks. I’m at $91 remaining in my budget and I checked “Mexican” off my list. El Guapo’s Southside, 8161 S Harvard Ave., 918.728-RITA. Elguaposcantina.com/southside. For a roll-up-your-sleeves-put-your-elbows-on-the-table experience, try Doc’s Wine and Food ½ Chicken Dinner. Being a fan of Doc’s but never having tried this special (Wednesdays only) I was intrigued. I had heard from a friend that this was a very filling and delicious meal for only $12, and she was absolutely correct. 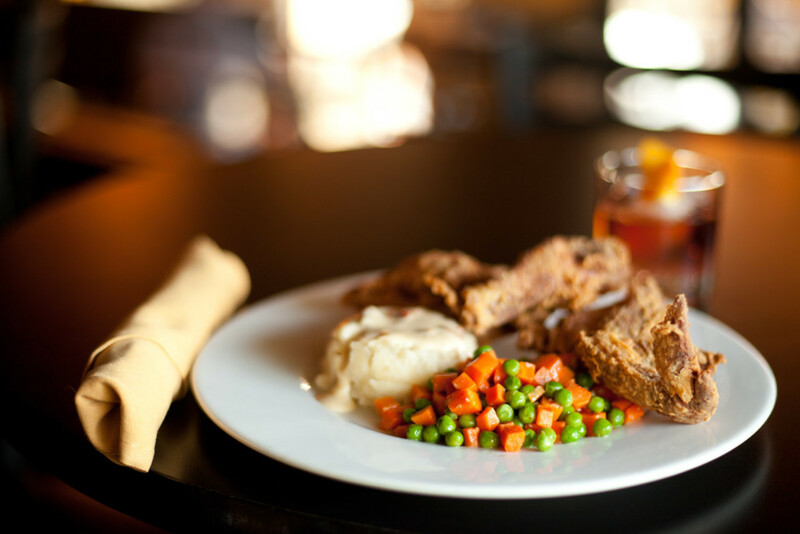 The dish includes a leg, thigh, breast and wing fried to a delicious golden brown, served with mashed potatoes, andouille sausage and gravy and a side of peas and carrots. Again, this is a dine-in only special so arrive early! It’s available at 4 pm until supplies last, and this special goes very quickly. $79 left and I just had a great dinner at one of my favorite places on Brookside. Doc’s Wine and Food, 3509 S Peoria Ave. 918.949.3663. www.docswineandfood.com. I suppose I would have counted last night’s chicken dinner in the “Southern Cuisine” category, but I felt compelled to indulge in some chicken fried goodness on Thursday night at Bros. Houligan. 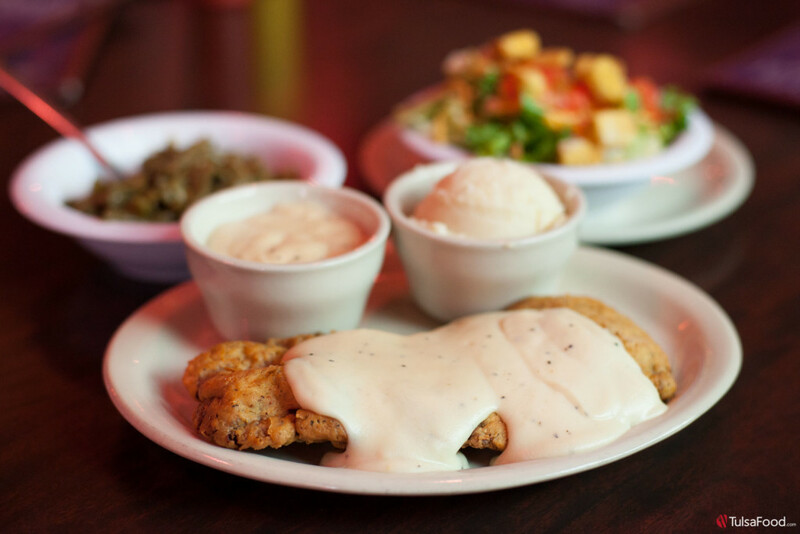 Regulars know very well of their Chicken Fried Steak Dinner special For $9.95 available on Thursdays 11 a.m. to 10 p.m. I enjoyed a generous breaded steak with gravy as good or better than grandma’s and endless sides of seasoned green beans and potatoes. You can also choose to include a third side from any of the following: cottage fries, French fries, tossed green salad, Cole slaw, applesauce or cottage cheese. 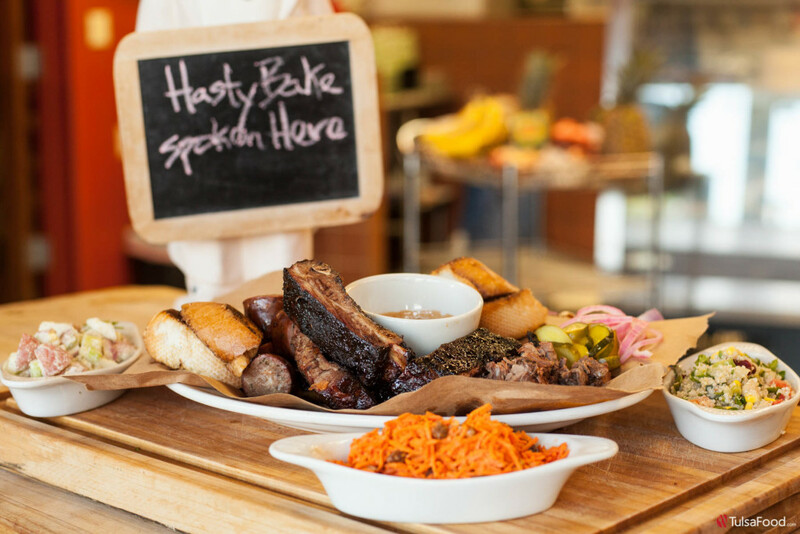 Brother’s Houligan enjoys their loyal fan base who either dine in – or carry home – this very special meal. Plenty to eat here – I wasn’t hungry again for a while. I found myself more than halfway through the dinner portion of the challenge with $30 spent and $69 remaining. I needed three more meals for about 33 bucks total to end up with around $35 for next week’s lunch portion of this mission. But at this point, I was entering the weekend where food deals are naturally more scarce. Bros. Houligan, 2508 E 15th St, 918.747.1086, www.broshouligan.com. I needed to find a quality seafood option at a bargain. So, I ended up enjoying ½ price sushi during happy hour at Yokozuna in the Blue Dome District . This special is available seven days a week from 3 – 6 pm and it is dine-in only. So I sat down for an early dinner at about 5:30pm and ordered the Golden Driller Roll ($4) and the Hot Mess Roll ($4). My date ordered the the Route 66 Roll – (still a bargain $8) – which includes imitation crab, shrimp, avocado with spicy sauce all rolled in sesame seeds and Edamame for only $3.00 extra. A total of two rolls is all I typically order (even when I’n not on a tight budget) so the two rolls I ordered were enough for me. 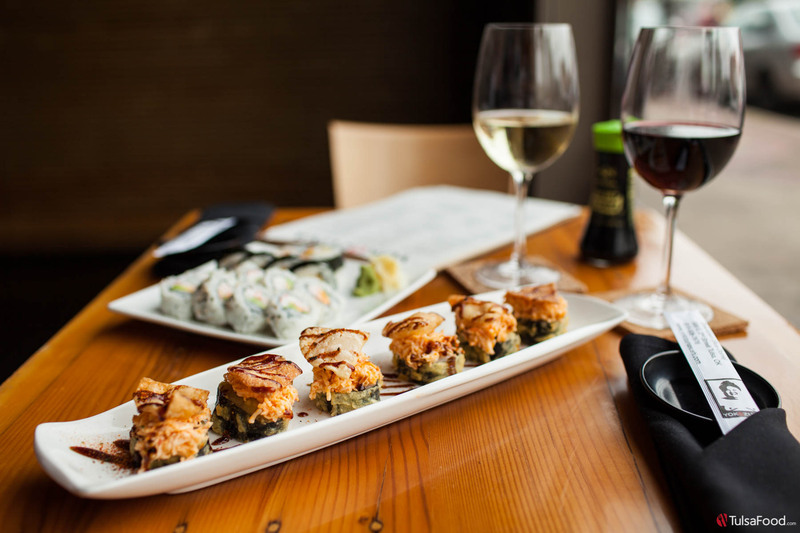 The Golden Driller Roll includes tempura shrimp, jalapeno and cream cheese with spicy mayo while the Hot Mess Roll includes chipotle cream cheese, jalapeno and imitation crab, tempura fried and topped with a mix of imitation crab and spicy tuna. All this topped with shrachi pepper, eel sauce, served with fried wonton chips, making it one of Yokozuna’s most requested items. These tasty treats are a great way to end the work-week with flavor and fun! Ok, I now had a respectable $59 left and needed to make through the two more weekend dinners. Yokozuna, 309 E 2nd St., 918-508-7676, www.yokozunasushi.com. It was Saturday evening and I still hadn’t had BBQ. So my mission to find Tulsa’s best priced dinner entrees took me to Boston Deli. 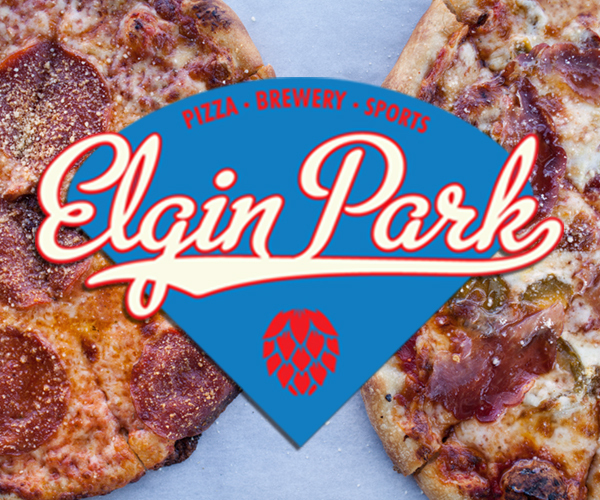 For over 22 years at the 61st and Sheridan location, it’s a stop worth making. My girlfriend and I split and enjoyed their Saturday special: Glazed Baby Ribs prepared over charcoal on a Hasty-Bake and served with garlic toast and choice of two sides for $17.00. For my two sides I chose baked beans (also only available on Saturday) and Knarly Tabouli. This twist on a favorite includes organic quinoa, garbanzo beans, kidney beans, Italian parsley, fresh lemon juice and olive oil. We split the entree and split the tab left me checking quality “BBQ” off the list and $50.50 left in my total budget. Boston Deli, 6231 E 61 St., 918.492.4745, www.thebostondeli.com. I had one more dinner to execute. This was difficult because I really wanted to end my dinner dining with $35 left for my 7 lunches next week. But, I also really wanted to work into this project McGill’s Steak and Lobster special for $20 per person (Sunday evenings only). Because, how cool would it be to accomplish Project 99 and include STEAK and LOBSTER at one of Tulsa’s most beloved steakhouses? I had to go for it. 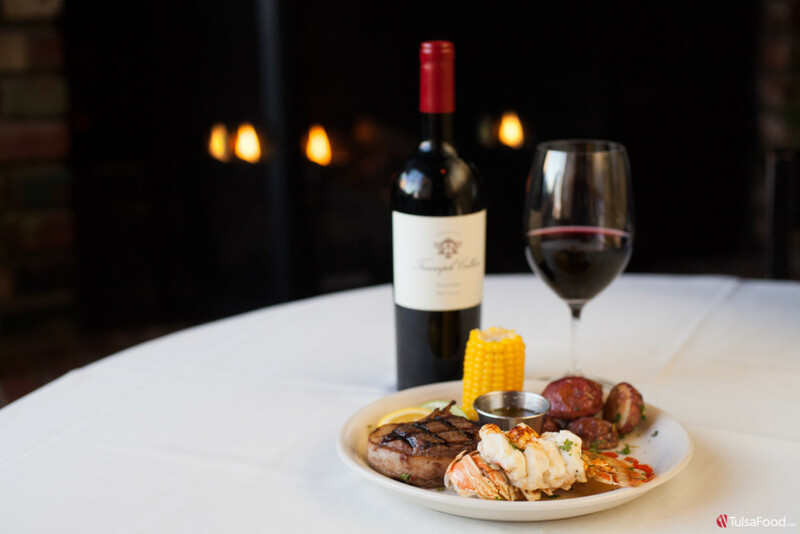 Beginning at 5 PM until close at 9 PM, McGill’s offers a five-ounce bacon wrapped filet with 5 ounces of warm water lobster tail for 20 bucks. Included with the entrée are roasted red rosemary new potatoes and a half ear of corn. It’s enjoyable to have steak that needs no heavy steak sauce to improve flavor. Served with a basket of bread and lobster-dipping butter, this was the perfect entrée to finish off a great flavorful week. I completed this week of dining out every night for dinner in Tulsa for a total of $68.50 (food only, before tax and gratuity). And, the amazing thing is that I ate very well and was full after each meal for an average of $9.79 per meal. I now have $30.50 left to spend on 7 lunches as I approach the last half of “Project 99”. At $4.35 per meal left in my pocket, I had some serious planning to do. Next – Part 2.